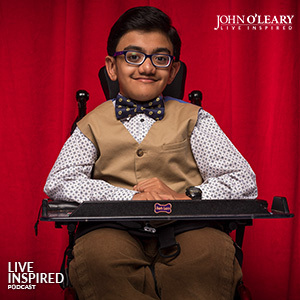 John O’Leary welcomes 15-year-old singing sensation Sparsh Shah onto the Live Inspired Podcast to share how his disability doesn’t define him. I’ve been so eager to bring Sparsh Shah onto the Live Inspired Podcast since I was first introduced to him in March 2017. Fifteen-year-old Sparsh shares about being born with Osteogenesis Imperfecta, or “Brittle Bone Disease”, and how he hasn’t let it define his life. Sparsh, also known by his rapper name Purythem, went viral with his rendition of Eminem’s Not Afraid and since sang the National Anthem at Madison Square Garden. He radiates positivity while owning his disability with awe-inspiring grace. 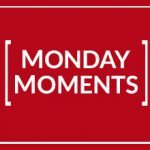 Today’s conversation is beaming with contagious optimism + resilience that will leave you inspired. Ragarap: Sparsh began studying classical Indian + Western vocal music, blending aspects of each into his performances and creating his own sound he calls “ragarap”. Sparsh chose to sing Eminem’s Not Afraid because of the uplighting lyrics that made him feel unstoppable; it ultimately became a viral hit viewed over 75 million times. Watch Sparsh Shah’s TEDx Talk, where he speaks of turning the impossible to “I am possible”, here. 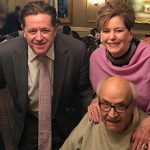 If you enjoyed Sparsh’s optimistic outlook of his disability, listen to Live Inspired Podcast ep. 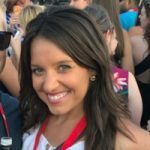 7 with hearing-impaired comedian Kathy Buckley and Live Inspired Podcast ep. 63 with paralyzed barrel racer Amberly Snyder. 2. What is a characteristic or trait that you possessed as a child that you wish you still exhibited today? Resilience and optimism. My dad said I had a smile that would light up anyone’s face. 4. You are sitting on a bench overlooking a gorgeous beach. You have the opportunity to have a long conversation with anyone living or dead. Who would it be? Jesus and I would ask him, “how and why is it that the life that is so imperfect, you made it perfect the way it is?” I’ve realized in life things are perfectly imperfect. 5. What is the best advice you’ve ever received? No matter what happens in your life, don’t give up on your passion. No matter how many bones you break, your voice will never break. You can do anything in life, you’ve come here for a reason. Did you enjoy today’s episode? Subscribe, rate + review on Apple Podcasts or wherever you get your podcasts!